A meaningful remembrance for any daughter who has lost their mother, this pendant carries a comforting message "Mom I miss you, my heart is with you...«. 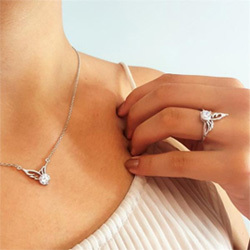 In addition, the necklace is adorned with a dainty angel wing, creating that unique Linda's Stars look. Has a few little scratches on it but my mom loved it. Bought it as a surprise mother's day gift since it's her first mother's day without my grandma. The necklace is beautiful. I love it. I just love them. I had no problems with shipping. They arrived on time. Very pleased. This was a great ft to my friends mother. She passed very young and when she received it she was overwhelmed with tears.